This article sheds light on the evolution of techniques and the design of these early Islamic ceramics and how during a series of migrations to new geographical locations, Islamic potters adapted the ceramic tradition to these new lands. Islamic potters, working as early as the ninth century in the heartland of Arabia, discovered valuable techniques in the design and production of ceramics that many centuries later were adopted by their Chinese and European counterparts. It was Islamic potters who created the blue-on-white aesthetic that had a long-lasting influence on the production of Chinese export porcelain and in turn ceramic production in Europe. European potters, in time, learned to create maiolica, Delftware and faience directly from the Islamic world. Islamic potters can also be credited for the innovation of the lustre technique that transformed ordinary objects of clay into shimmering metallic works of art. As well as influences on design, a series of innovations in ceramic production is the greatest legacy of Islamic potters. In twelfth century Egypt, a newly migrated group of potters incorporated quartz into the local clay to improve the quality. This eventually led to a new class of fine ceramics known as fritware (or more recently called stonepaste) that eventually displaced earthenware as a medium for ceramic production in Syria and Iran. On the left: earthenware bowl with a tin-white glaze, 9th century Basra, Iraq. On the right: stoneware bowl, 700-900 China. Islamic ceramics production gained momentum in ninth-century Abbasid Iraq during a period referred to as the golden age of Islamic culture, a time in which literature, philosophy, science and artistic endeavor flourished in a region that cultivated trade connections with countries as far away as China. From their capital in Baghdad and later Samarra, the powerful Abbasid Caliphate (750-1258) ruled over territories in North Africa, Iraq and Iran. It was in the port city of Basra on the Persian Gulf that local potters learned to create beautiful ceramics, and this is where our journey begins. Early Basran ceramics were inspired by the Chinese T’ang Dynasty (AD 618-906) wares that reached Iraq via the maritime trade routes that existed at time. Archaeological excavations carried out in the port cities of the Persian Gulf unearthed medieval Chinese T’ang stoneware and porcelain. It is highly likely that these Chinese imports inspired Basran potters to create their own versions of Chinese porcelain, which were probably expensive to import and susceptible to damage during shipping due to their fragility. Chinese porcelain incorporated an important raw material, kaolin, which needed a firing temperature of 1400 degrees in specialized kilns. Kaolin was unavailable in Iraq, and the method of porcelain production was secretly guarded by the Chinese. Basran potters, through experimentation, discovered that tin-oxide glazed earthenware on firing at 900 degrees produced an opaque white glaze that successfully imitated the Chinese porcelain. Fig.1 illustrates an example of a Basran imitation (RHS) of a Chinese original (LHS). Once this technique was successfully mastered, Basran potters further experimented with the decoration of these blank ‘canvases’. This step is what distinguished the Islamic potter from the Chinese T’ang potter– the insatiable need to decorate a plain object, otherwise esteemed by other cultures for its whiteness and translucence. This is the inherent nature of Islamic art, referred to by the great, late scholar Richard Ettinghausen in his 1971 article where he gives many a fine example of the ‘busy’ nature of Islamic art (Ettinghausen, 1979). 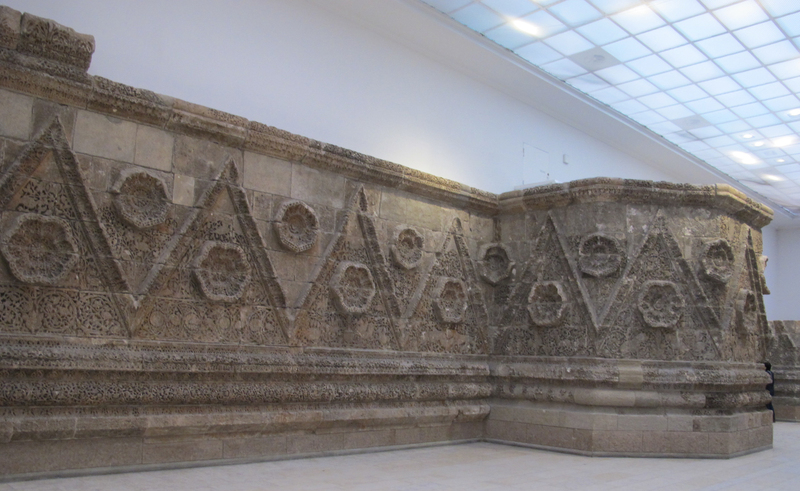 The Horror Vacui is illustrated in the detailed arabesque exhibited in the 7th Century Mshatta façade, and can be seen Spain’s Madinat-al-Zahra. The Islamic potter, not content with leaving the bowls in plain state, set about fashioning it with motifs from the established vocabulary of Islamic design of the time. What followed was a series of ceramic designs that explored simple abstract, geometric and non-figurative pattern and design with the use of colorful pigments derived from cobalt (blue), copper (green) and manganese (purple) to add drama and substance to these creations. Lustre was first applied to glass by Islamic craftsmen and later used for a ceramic body by Basran craftsmen in ninth century Iraq. A complex and expensive technique, lustre painting involved applying lustre as a paste (usually copper and silver oxides) to tin-glazed earthenware, followed by firing in a ‘reduced-oxygen’ kiln to produce objects with a metallic sheen. Basran craftsmen painted simple abstract lustre designs that included human figures, as well as animal and vegetative forms. The lustre technique was highly specialized and was believed to be a ‘secret’ technique confined to a few craftsmen who therefore held a monopoly on this process. Its practice seems to have abruptly ceased in the tenth century as economic decline set in to Abbasid Iraq. It is highly likely that craftsmen from Basra left for Cairo in search of work, as this technique simultaneously appeared in Fatimid Egypt. The power and influence of the Abbasid Dynasty in Iraq eventually began a long and slow decline, and the centres of power shifted to new regional centres. The Fatimid Dynasty (969-1171) came to rule parts of North Africa, Sicily, Egypt and Syria and established a capital in Cairo. Fatimid rulers traced their descent from Fatima, Prophet Muhammad’s daughter, and unlike the Sunni Abbasid Dynasty, the Fatimids were Shi’i. Egypt enjoyed great prosperity at the time due to its unique geographical location, allowing it to benefit from lucrative trade routes connecting it to the Mediterranean world and India. The affluent Fatimid court attracted artisans from neighboring territories, and Cairo soon became the most important cultural centre of the Islamic world. Fustat, a neighboring town, became a centre of production of pottery, glass, metalwork, rock-crystal, ivory, woodcarving and textile production. Fatimid art is remarkably rich in detail in its decoration; scenes often show dancing and hunting. Here artisans took inspiration from ancient forms of Greek and Roman figural representation and combined these with the non-figurative designs experimented with in the early Islamic art of the Umayyads and Abbasids to create a new design repertoire. The lustre technique developed in Basra became the primary form of ceramic decoration in Fatimid Egypt, and a large number of quality lustre pieces in museums and collections today, with evidence from archaeological excavations, indicate lustreware was produced in large quantities. Potters in Egypt, now using a different clay than what they had used in Basra, set about improving the clay mixture with the addition of quartz; this was an important step in the evolution of the ceramic tradition, as this new body called ‘fritware’ lent versatility and ease to the shaping of earthenware. Fritware, as this new medium began to be named, also had a whiter appearance, creating more visually appealing glazed wares than those produced using earthenware. Fritware eventually replaced earthenware as the main ceramic medium in the twelfth and thirteenth centuries in the eastern Islamic world. More incidents of human and animal depictions occur in ceramics in Fatimid Egypt than in Basra. Human and animal imagery employed a lively realism not exhibited in Basra. This liberal approach to representational art was characteristic of the Fatimid Dynasty in general. Fatimid lustre ceramics later became an important form of documentation of painting of this particular period. The Fatimids were considered heretics by the new incoming Sunni Ayyubid Dynasty, so some documents and palaces (non-religious buildings) were sadly destroyed. The lustre technique reached its height in the Fatimid capital of Cairo, then gradually faded out, moving onto Syria, Iran and, at some point in time, Spain, when the Fatimid Dynasty eventually collapsed in 1171. The David Collection, Copenhagen. Photographer: Pernille Klemp. The Samanids (819-1005) were a Sunni dynasty that ruled northeast Iran and western Central Asia from their capital Bukhara. Under the Samanids the Iranian world regained its cultural identity, and Bukhara and Samarkand became major centres of learning and civilization. The tenth century was the height of Iranian poetry and literature; Rudaki (d. 940) was a great Samanid court poet and one of Persia’s greatest poets. Firdausi (d.1020) continued the epic Shahanamah (Book of Kings) under Samanid patronage. The Samanids encouraged a revival of Persian pre-Islamic culture and the use of Persian instead of Arabic in court. Paradoxically, it was in the midst of the Persian literary revival that a significant group of slip-painted wares decorated exclusively in Arabic calligraphy emerged. In Samarkand local potters developed pottery from methods that were quiet different from those currently being used contemporaneously in Basra and had little direct influence from Chinese wares. Here, a technique was developed that involved dipping the entire earthenware piece into a white, red or in some cases black liquid opaque clay called slip. Once dried this would provide a uniform background for decoration that was created with a contrasting coloured liquid opaque clay slip. 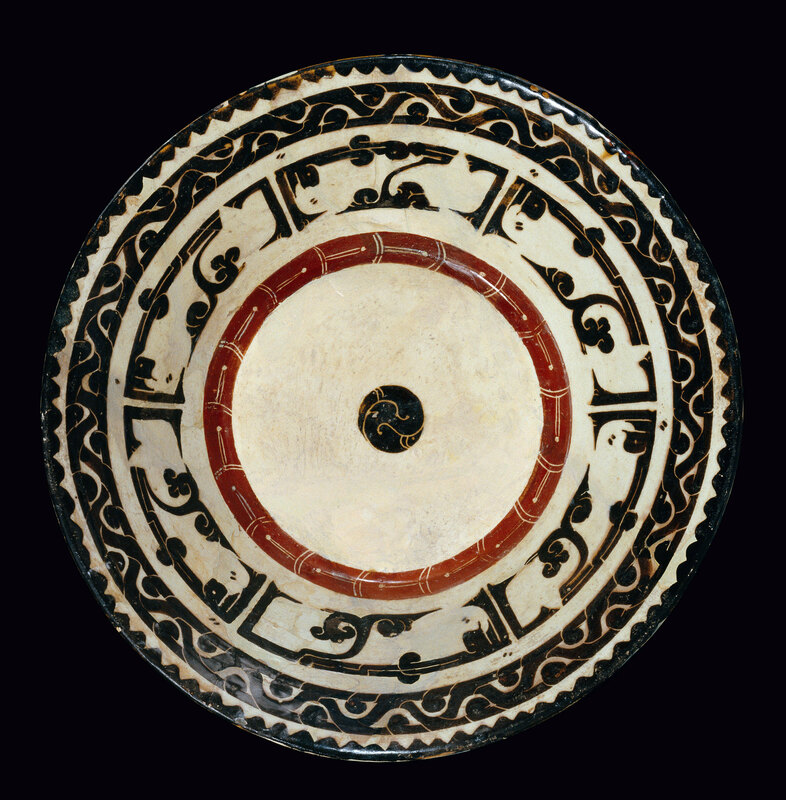 This method, known as ‘slip-painted’, is unique to this region and common to a distinct group of ceramics known as Samanid epigraphic slip-wares, which were often covered in creamy white slip backgrounds with dark brown or black calligraphic inscriptions applied in a graceful rhythmic fashion. Another town in Iran, Kashan, became the dominant centre for ceramic production in the Islamic world in the late twelfth and thirteenth centuries. 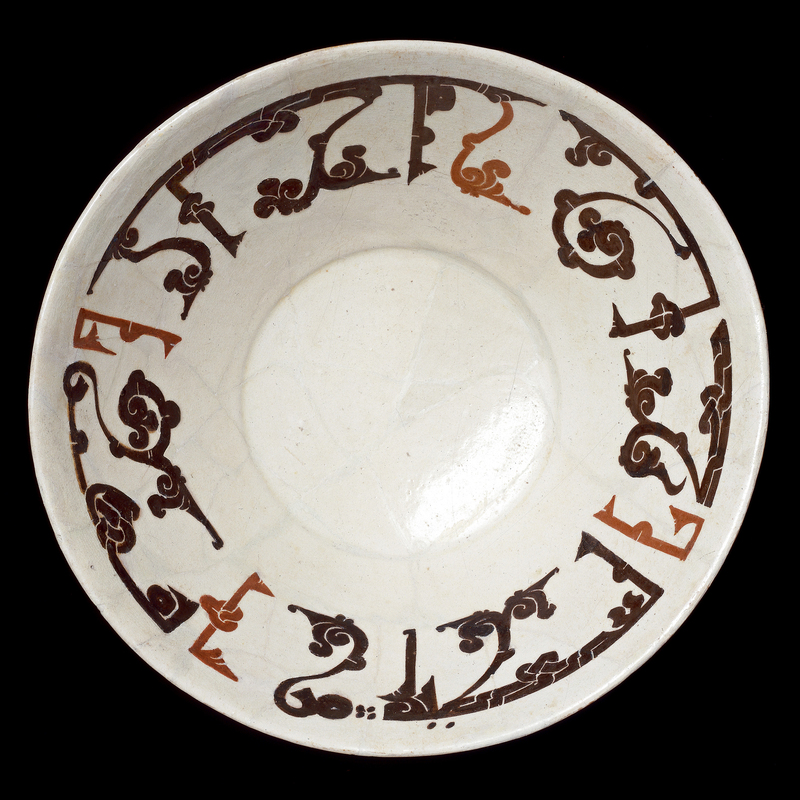 The fritware that began to be created in twelfth-century Fatimid Egypt seems to have been the only type of ceramic produced in Kashan and may have arrived there via Syria. We are extremely fortunate to have a manuscript dated 1300 AD that describes ceramic production written by Abu’l-Qasim, a member of a well-known Abu Tahir ceramic family of Kashan. This important document describes in detail the materials and the process of ceramic production in Kashan. Despite Mongol upheavals in 1258, ceramic production continued in Kashan, though with notable changes in style and output. Under the patronage of the Mongol overlords, an interesting exchange of Chinese and Islamic motifs and design occurred on arts of this period. The fifteenth century saw the impact of Chinese blue-and-white painted porcelain that began arriving in the Middle East in the mid-fourteenth century. This colour palette, believed to have been inspired by early Basran potters’ cobalt-blue-on-white wares, came back in vogue in the Islamic world as mid-fifteenth century potters eagerly adopted this colour range, now popularised in the production of Chinese blue-and-white porcelain. Over the course of time, the Islamic ceramic tradition took on new forms and meaning reflecting local tastes and materials. Islamic potters seem to have been a mobile group of artisans who responded and adapted to new environments well and managed to transfer their skills with relative ease. Ceramic production continued from the early phase described above and established itself in new centres of the Islamic world: Kashan in Iran, Raqqa in Syria, Islamic Spain and Ottoman Turkey. Arthur Lane, Early Islamic Pottery, Faber and Faber, London, 1947.